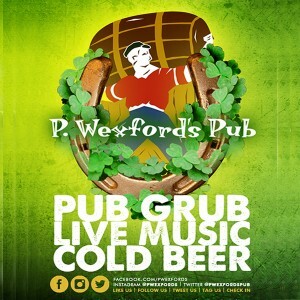 Week 2 Starts off with Poorhouse Duo at Bauhaus on Tuesday and you can find Rob Hill Band at the Barkin’ Dog on Saturday the 13th with a few other acts you won’t want to miss either. 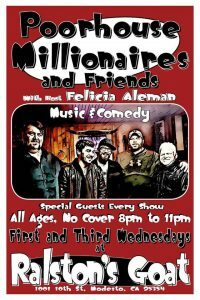 Rounding 3rd we have Poorhouse Millionaires back at Ralston’s Goat for Wednesday night. That Friday the 19th you can catch Jeramy Norris and the Dangerous Mood at Valley Brew in Stockton. If you haven’t seen Jeramy this is a great opportunity to catch him in a great room. Now on the 20th, you have a few options, you can catch Tony and the Tuff Times over at Barkin’ Dog. 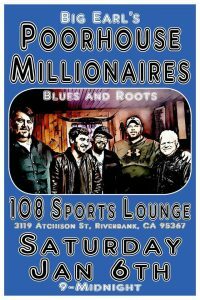 You could head up to Moke Hill and catch Jeramy Norris and the Dangerous Mood at Hotel Ledger, or you can join me up in Sonora to check out Cole Hinkle, Mattea Overstreet and the Poorhouse Millionaires. One last chance to catch me on the 23rd with my main man Ray Vazira at Bauhaus, 6 pm. January is normally a bit of a slow music month but, I did my best to give you some cool options. Enjoy the new year, and I hope to see you out at a show.